Get a brand new energy-efficient A-rated boiler installed from £1500 +VAT. New Boiler Installations by Gas Safe Registered experts here in London. Get a free instant online boiler installation price. At Master Gas, we realise that having a new boiler installed for the first time can bring with it a fair share of concerns and questions. As such, our staff have thoughtfully compiled this boiler installation guide to help put you at ease and to help you choose the right product for your demands. Master Gas is a Gas Safe Registered Boiler installation Essex based company. We are locally based so can provide you with a fast response service. Our goal is to provide our customers with the best boiler installation service in Essex. We pride ourselves on delivering top rate customer service to help answer any questions that are not detailed here. Our company has earned many awards for our professional boiler fitting services and can proudly install a new energy-efficient A-rated Vaillant or Worcester Bosch boiler for you starting at £1150 +VAT. We are also separately monitored and endorsed by Checkatrade. Visit our Checkatrade reviews page and read all of our customer reviews. We’re sure you’ll be impressed to find that many of our customers have happily rated our company a 10 out of 10. For an award-winning professional new boiler installation service in Essex, you can contact our staff on 07948 009 319, or contact us online to get a free installation quote. There are just three simple steps to getting a new boiler installed. Just schedule an appointment for a survey, receive a quote, and select a date at your convenience for one of our Gas Safe Registered engineers to begin the professional boiler installation. Once our team has finished your survey, we will provide you with a ‘no obligation’ fixed price quote for your new boiler. If the price that we quote is to your liking, our team can organise a time and date that suits your schedule for your installation to begin. 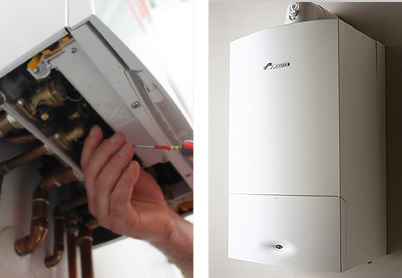 Master Gas are accredited Worcester Bosch and Vaillant boiler installation providers. Therefore, when we install these boilers, you can rest assured we do it to the highest standards as required by these manufacturers. Worcester is an industry leader. This means whether you select a Worcester system or a combi boiler you can feel confident that you are receiving the best. New Worcester Bosch boilers are also SEDBUK A-Rated to provide the highest efficiency, which not only allows you to do your part to help improve the environment, but it also helps keep your heating bills low. Boiler Installation – How long does it take to install a new boiler? Installing a new boiler usually takes no longer than three days; however, we strive to have your new boiler installed in just one day so that you are not without hot water or heat for a number of days. When you choose us, you can be assured our primary focus is to get your system properly installed and functioning efficiently and in as little time as possible. And because at Master Gas, our team are professional and verified Gas Safe Registered Boiler Engineers; you can feel confident that when we install your new boiler, we are qualified to do so and most safely and efficiently. In fact, the entire installation process is overseen by our project manager who is dedicated to making sure that everything goes according to plan. For more urgent jobs, our expert installers can get over to you swiftly to carry out repairs, usually within the hour for emergencies. Before your installation, we will work with you, so you know exactly what to expect from us. With each project, we present you with an estimate and make sure it as detailed as possible so you can see the costs to fit your new boiler as well as the work we plan to do for you. We will also work on Saturdays and Sundays, where possible. Otherwise, our Gas Safe Certified engineers can be there for your boiler installation Essex service within a day of contacting us. Below are some frequently asked questions regarding New Boiler Installations in Essex. If you require further information on our Boiler Installation Essex service, then please do not hesitate to get in touch. We fit many types of boilers and for many kinds of buildings, including commercial boiler installation, gas boiler installation, electric boiler installation, conventional, system, and combi boilers. Do you install boilers in the UK or just Essex? We provide professional boiler fittings throughout Essex, and the London area surrounding our HQ in Walthamstow, including South West London, Central London, and North West London. Yes. In fact, we have a quick and easy Boiler Estimate System that provides you with an instant free installation quote. Just visit our Boiler Estimate System to get a free quote for your Vaillant boiler installation, electric boiler installation, commercial boiler installation, or other new boiler Essex needs.